Sassy Satchel, 3 coats with Seche Vite. Yikes I did not realize my shots were all bad til the next day when I went to pick one out. Anyway this is more vampy in person, it looks more rich and earthy. This one does have a really great shimmer to it. I finally cut my nails, and it was so I can play Crysis. Sad I know lol but it's so fun! I filed them down waaaaay too short, my hyponychium is showing in several of my nails (hah thanks to Mitsue for teaching me that part!) I try to nip them away but ow just barely touching it is so sensitive! I hope that part goes away soon. Just because I felt like it I'm going to throw this in, one of my favorites Russian Ruby! Your nails still look beautiful, but I hope the pain goes away soon :) That's a pretty shade by Essie, I think it looks very rich. That Essie is so pretty!!! Both manicures are lovely. The Russian Ruby is really a beautiful shade. I love the butterfly on your nails. The things you have to do to play games! Your nails still look lovely. I'm sorry you didn't win the Illmasqua contest. I thought your manicure was amazing. You did make the finals! I'm still proud of you. Your nails look great long and short! I love the Russian Ruby manicure with the butterfly stamp. That's gorgeous! I think your nails look beautiful always Kae, hope they stop feeling sore soon. I hate having ghost nails! aww thanks, me too! feeling less sensitive today. Thank you! yeah they feel better today! Lol that makes me think of wearing a band aid for a day on a fingertip, then taking it off hours later or the next day and it feels all weird and sensitive. ok I'm done being weird! 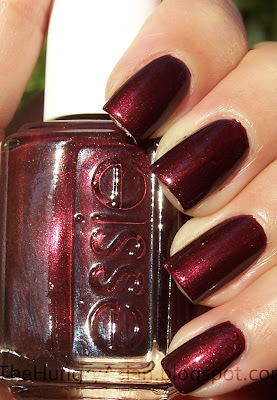 The essie is such a gorgeous vampy color, love the konad so pretty! This vampy shade is absolutely perfect ! Oooh, Sassy Satchel looks like a great fall color! Haha, now I need to look up that word. And the Russian Ruby makes me want Strawberry Starburst. How's that for weird? Your nails look great though! thanks! I love fall and these colors that go with it! mmm I love fall and the smell of wood burning (chimney smoke?)! I just got my first Essie polishes! I'm excited to try them out seeing as everyone always talks so highly of them. By the way- I tagged you on my blog! aaaahhhh - your nails were so long and pretty! but they will grow again - lol that you did it for a game. hah! at least they will grow back fast. lol yeah the things I will do to play a game!